Sweden don't make Finland angry. Russia has taught him several things. He isn't weak. . Wallpaper and background images in the Hetalia club tagged: photo. No, Finland definitely isn't weak! (^_^) This picture is so funny! Well he lived 100 years in Russia's house and this is true. We were under Russian rule for 100 years before we became independent in the year 1917. So historically RusFin couple is true. It really is true. Have you heard about 2P Finland? He doesn't like 1P Finland, 1PSweden, is in love with Russia. RusFin couple really is historically true because like I said earlier we really were 100 years under Russian rule before we became Independent in the year 1917 and this is true. This is the true history. In true history Finland never came back to Sweden after he left from Russia's house and became independent. Sweden didn't give us any good things. He didn't give us Autonomy like Russia did and freedom and Russia did that to us too. We were much happier when were under Russian rule. Oh and one thing from 2P Finland still he calls 1PFinland to White and 1PFinland calls 2PFinland to Red. White and Red Finland are true because of Finland's history and I know this. I even like RusFin. 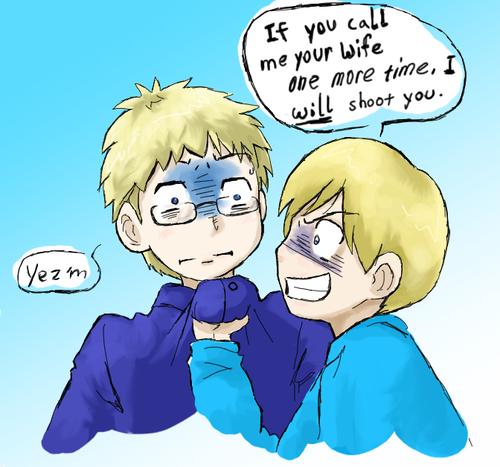 It is one of my favourite Finland couples and I like UKFin too even though it is a rare one like PrusFin and GerFin are. Germany is actually Finland's friend too because he and Prussia even helped us in one of our wars. 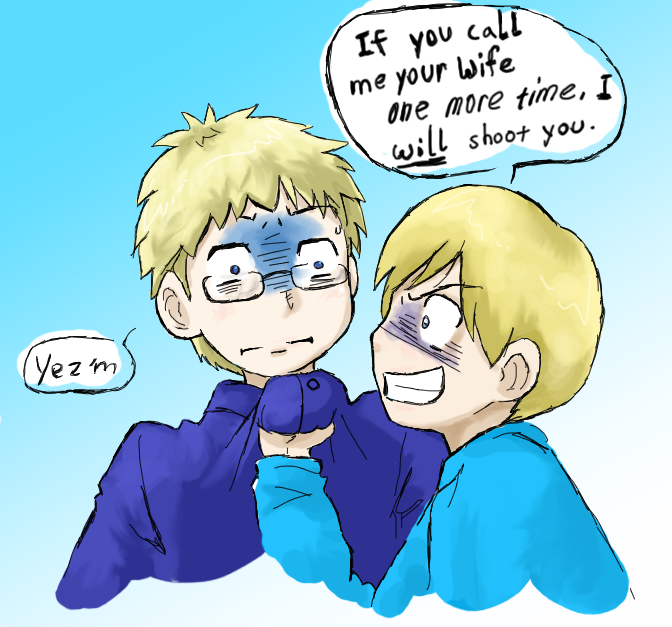 Oh by the Way Aph Finland if you want to know more from Finland's history please send me a PM. I actually call this to his 2P side. I happen to like 2P Finland too.